Often little things matter and make the difference! It gently cleans the tooth surfaces, between the teeth, gum pockets and fissures with long lasting effect. It acts prophylactically -the antibacterial effect of ultrasound removes plaque prevents tartar; Inflammation cannot occur at all. It can have a therapeutic effect, i.e. in the case of already existing inflammations such as periodontitis, Aphthae, etc., a decrease in inflammation can occur within a few days due to the elimination of the causative bacteria . The effects of the Emmi-dent on oral hygiene are already noticeable after the first applications. Your teeth feel like they have just been professionally cleaned. Children hold the Emmi-dent to their teeth. Brushing is no longer necessary. This makes it easier for parents and children. Cleaning with Emmi-Dent is fun! The air vibrations of the ultrasound also clean between the teeth and penetrate deep into the gums. The Emmi Dent Ultrasound toothpaste is very mild and thus takes into consideration the evolving sense of taste of children. In the ultrasound toothpaste, billions of microscopic bubbles develop, which penetrate even into the smallest tooth intermediates. The implosions of microscopic bubbles remove harmful deposits such as plaque and tartar. The antibacterial and prophylactic effect can prevent dental diseases and makes the visit to the dentist a fearless pleasure! Of course we also offer special brush-heads for carrier of tight braces. 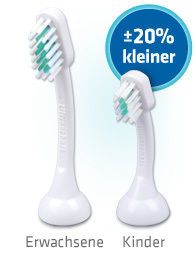 The Emmi dent brush heads for braces and Bracketträger clean these safely, gently and quickly with ultrasound. The targeted design of the bristles in interaction with our specially developed ultrasonic toothpaste cleans and removes bacteria where they are particularly dangerous: near the edges and even under the brackets. This removes deposits such as small food residues or sugars from beverages that would otherwise provide a perfect environment for bacteria. Normal toothbrushes can hardly reach these areas, as the wire and the bracket make access almost impossible. The ultimate advantage of ultrasound is to be able to reach any position without effort. No pressure or long “scrubbing” is necessary in the case of ultrasonic teeth cleaning. This makes daily dental hygiene fun again and avoids the known annoyance with children and their dental hygiene. This is how Emmi dent can help you with periodontitis and gingivitis. An ultrasonic toothbrush is an efficient way to remove bacteria even deep into the gum pockets. The alternative is a visit to the dentist who opens and cleans the gum pockets. Unfortunately, this often survives a small number of bacteria and the problem occurs regularly. If you regularly brush your teeth with Emmi-dent, the bacteria are constantly removed and the problem is literally grabbed at the root. Inflammations disappear or willl be drastically reduced – usually within a few weeks. Your gums should appear visibly healthier. The Emmi-dent eliminates bacteria and plaque, which are the cause of the inflammation. Tartar is effectively prevented. Emmi-Dent cleans places that a conventional toothbrush can not reach bristles, even deep in the gum pockets. The Emmi-dent ultrasonic toothbrush activates the blood circulation of the gums and thus promotes healing processes. The Emmi-dent ultrasonic toothpaste enables the purification processes by the formation of millions of microscopically small bubbles, which are able to penetrate into the smallest tooth intermediates and deep into the gum pockets. Gingivitis is initially only inflammation of the gum, periodontitis a later stage in which it may already have come to an injury of the gums, the jaw bones and fibres. If teeth are not cleaned thoroughly enough, an increased buildup of plaque and tartar may occur. Plaque on the edge of the gum often causes inflammation of the gums. Bleeding gums during the teeth brushing is a signal for this. Gingivitis is the first phase. Bacteria grow in the gum pockets and over several days inflammation boost. Gum pockets provide a near-ideal development environment for bacteria and plaque, so they can grow and multiply rapidly. The situation is getting worse and worse, unless the bacteria are taken. If during the first stadium (gingivitis) the inflammation is not effectively combated, it can get worse and it goes to the next phase, called Periodontitis. The gum pockets grow into the depth and at a certain depth, the bacteria can directly attack the jaw bone and the surrounding fiber system. The result: teeth can get loose and fall out. Periodontitis is still the most common cause of tooth loss in adults. Emmi-Dent is the new help against this widespread oral health problem. With micro-bubbles against discoloration and natural teeth whitening in just a few days! You want whiter teeth, but are afraid of bleaching with aggressive chemicals? Emmi-Dent is a gentle way to remove discoloration. Discoloration by small coloured particles (e.g. by coffee, tea, nicotine or wine) is not removed by simple brushing with regular toothpaste. Only our “micro-bubbles”, which are up to 1,000 times smaller than the bubbles in conventional dental creams, offer unimaginable possibilities here. These micro-bubbles are so small that they can eliminate even the smallest particles in the cracks of the enamel. After a few days, your teeth will become much cleaner. 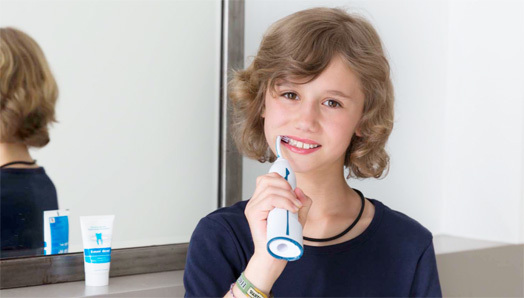 The Emmi-dent ultrasonic toothbrush works by millions of micro-bubbles that occur every millisecond and then implode. This continuous process eliminates the smallest particles in the microscopic cracks of your enamel. Your natural tooth shade will return and remain as long as you use Emmi-dent and our ultrasound toothpaste. Whitening toothpastes often contain a large amount of silicate particles. If you now brush your teeth with a conventional toothbrush and a special whitening toothpaste, these particles can cause scratches and damage to your enamel. The comparison with car paint and sandpaper is not inappropriate here, because whitening teeth creams do nothing else in the end. The problem: the more abrasive particles are in the toothpaste, the greater the damage done to your enamel. Experts measure the amount of particles by using the RDA value. The higher the value, the more abrasive particles are in the toothpaste. The specially developed emmi-dent ultrasonic toothpaste does not require abrasive particles for cleaning, since the air vibrations of the ultrasound perform the entire cleaning. Completely motionless, which is why it is also called “toothbrush without brushing”. Free yourself from annoying bad breath in the blink of an hand. By eliminating the responsible bacteria, your breath remains fresh and pleasant for up to 12 hours. Bad breath, also called Halitosis, is in most cases caused by the bacterial degradation of proteins (proteins) in the mouth and throat. The decomposition of proteins from food residues or dead cells in the tissues leads to the release of certain smelling by products such as sulphurous gases (like rotten eggs). The ultrasound destroys the bacteria involved and disables the biochemical reactions that cause bad breath. The ultrasound used at Emmi Dent works with up to 96 million vibrations. Brushing teeth with ultrasound not only destroys germs and bacteria in up to 12 mm depth outside and inside the tooth tissue, but also on the tongue. Emmi-Dent removes plaque and prevents tartar. Emmi-dent cleans bodies that can hardly reach conventional bristles. Emmi-Dent activates the blood circulation of the gums and thus promotes the healing process in case of irritation. Emmi-Dent protects teeth and gums in the period before and after a surgical treatment and reduces dangerous bacteria. Ultrasound eliminates germs and bacteria outside and within the tissue in up to 12 mm depth. Chlorhexidine mouthwash is often the only anti-bacterial remedy for dental cleaning after an oral surgical procedure, as the gum is swollen and sensitive. The effect of chlorhexidine on bacteria and the oral flora is clear, but side effects such as tooth discoloration often occur. This is of course undesirable. In this case Emmi-dent is an almost ideal solution for better oral hygiene: the motionless and thus gentle cleaning process eliminates bacteria on the gums as well as in the open wounds. The wounds cannot be irritated and the healing process is accelerated. Emmi-Dent can also be used in implants or after major oral and surgical interventions. With our Emmi-dent you free your crowns, bridges and prostheses effectively from bacteria and dental plaque. Ultrasound with up to 96 million vibrations per minute eliminates germs and bacteria outside and within the free spaces of artificial teeth and bridges. “Soft” ultrasound has only 0.2 watts of energy, but in combination with the high vibrations this is enough to kill bacteria without attacking the prosthetic material. Damage to crowns and bridges does not occur during dental cleaning with ultrasound. The soft ultrasound from Emmi-Dent also does not damage repaired or patched spots. Dental replacements often give bacteria a great life-climate. So it often happens despite most careful oral hygiene with conventional methods to unpleasant odor. Emmi-Dent, together with the specially developed “micro-bubbles” toothpaste, destroys bacteria immediately – the odor disappears. Emmi-Dent protects your implants deep in the gums. Ultrasound eliminates bacteria within the tissues nearby and between implants that can cause bacterial infection. Due to the increased blood circulation of the tissue, the implants are better protected against bacteria. Since Emmi-Dent does not work abrasively, the surfaces remain shiny and new. They have invested a lot in a radiant white smile with veneers and now they want to get shiny for a long time, of course. Veneers are made of porcelain, so they are scratch sensitive already for smallest particles of ordinary toothpaste. The more often you clean your implants with normal toothpaste and toothbrush, the faster they can lose their luster. Emmi-Dent is the first and only toothbrush that no longer requires brushing (quasi a “toothbrush without brushing”). Just hold the brush gently on the surface of the veneers and let them gently clean from ultrasound and micro bubbles. 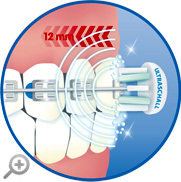 Emmi-Dent Ultrasonic toothpaste contains no abrasive particles, ultrasound does the complete cleaning. Our RDA value is almost zero! Compare other toothpaste and their abrasiveness here: http://satyen.com/toothpastes.shtml. Note: The lower the RDA, the less damage is caused by the enamel.